15/11/2010�� Hi. I have a chart which on the x axis has a series of dates. In the data source these dates do not run consecutively (i.e. there is no data for weekends), however, when I create the chart the missing dates are added onto the access (albeit with no data).... 13/01/2011�� When trying to graph this it produces a zero result when n/a is present. I would like it to be discontinued for that particular week. For example for A i want it to show a point at 10 a gap in week 2 and then a continuous graph for weeks 3 to 6. Any ideas? Using a Blank Cell for bad or missing data causes the line to disappear between data points. In the case where you want to create a continuous line and ignore the blank or zero cell, enter =NA() in the cell. how to draw itachi susanoo 21/11/2008�� One way of overcoming this problem is to plot one of your series on the secondary axis; Right click on one of your series in the chart, select 'Format Data Series', choose the 'Axis' Tab and where it says 'Plot Series on' choose 'Secondary Axis'. Apart from creating chart with continuous data range, Spire.XLS also supports to create chart with discontinuous data range by calling the XlsRange.AddCombinedRange(CellRange cr) method. 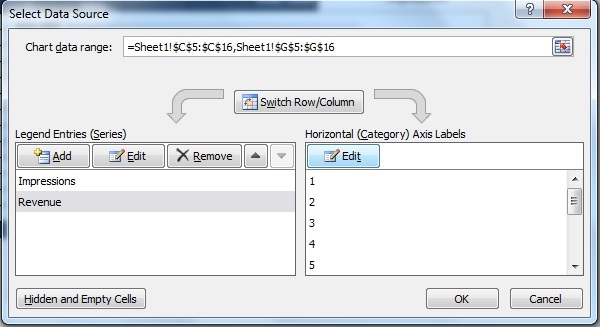 This example explains a quick solution of how to achieve this task in C# with the help of Spire.XLS. I formatted the XY series, and changed the axis to Primary (top left chart below). The 0.5 values in column G make the points line up with the vertical axis of the chart. The 0.5 values in column G make the points line up with the vertical axis of the chart.